The Mazda SL35 engine (as well as it’s SL35T and SL35Ti variants) was offered as a conversion kit for Range Rovers and other Land Rovers in the 80s and 90s. Many are still going and have found their ways into various other vehicles, Land Rover or not. 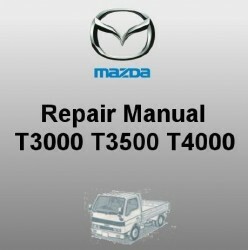 The workshop manual linked below is for the Mazda T3000, T3500 and T4000 light trucks, also known as the Titan or as the badge-engineered Ford Trader. The number referred to the engine capacity, with the T3000 referring to the 3.0L ‘HA’ engine (actually a Perkins 4.182 manufactured by Mazda under licence – also fitted to some Land Rovers), the T3500 referring to the 3.5L ‘SL’ engine (the subject of this article), and the T4000 referring to the 4.0l ‘SF’ engine. As a result, much of this document is not relevant to those with a 35SL engine conversion, however the Engine, Lubrication, Cooling, Fueling, Electrical, and Technical Data sections may well be. Please bear in mind that you are reading a workshop manual for a Mazda truck, so descriptions of piping, electrical setups, exhaust brakes etc. probably won’t have any relevance to the installation in your Land Rover.